When USSbriefs began, the initial team behind it simply pulled together a series of issues that they felt were of the highest importance to help inform people about the USS dispute. The aim was to provide original, informed, well-evidenced, clear and accessible briefs covering various aspects of the dispute. Priority was given to issues which were not well covered in existing communications from USS, UUK or our own central UCU leadership. After the first few batches of briefs had appeared, the team then wrote and commissioned new ones. Some of those newer briefs were immediate responses to new developments, such as the opening of the ballot on the UUK proposal. These aims underpin our editorial policy. In some cases, the initial team has the requisite skills to author the briefs in house. Where this is not possible, the team seeks to commission briefs. We are not an open platform, but if potential authors want to contact us with a pitch, we will look at it. As a rule, we do not republish pieces that have already appeared elsewhere. 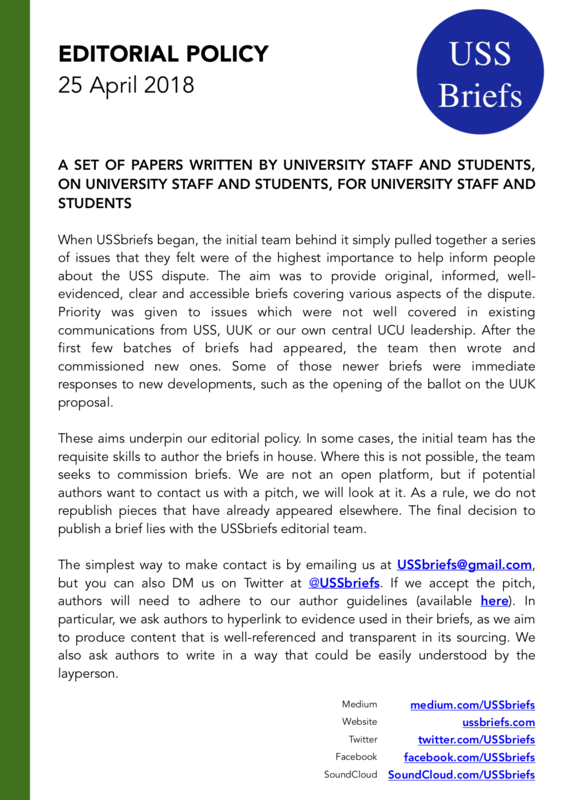 The final decision to publish a brief lies with the USSbriefs editorial team. The simplest way to make contact is by emailing us at USSbriefs@gmail.com, but you can also DM us on Twitter at @USSbriefs. If we accept the pitch, authors will need to adhere to our author guidelines (available here). In particular, we ask authors to hyperlink to evidence used in their briefs, as we aim to produce content that is well-referenced and transparent in its sourcing. We also ask authors to write in a way that could be easily understood by the layperson. Download this Editorial Policy as a PDF, or as a PNG.